On the one hand was the “Maximum Leader” of the Cuban Revolution who remained in power for almost 50 years, from 1959 to 2008, before illness led him to hand over power definitively to his brother. On the other was the former Theology Professor who, in 1959, had just begun a teaching career in Bonn and who seven years later was to become the leader of the universal Church. Reaching the end of his life, the revolutionary atheist showed a keen interest in religious questions, “interrogating” Peter’s successor. He followed Benedict XVI’s apostolic visit on the television and noticed some variations in the liturgy since his younger days. So the Pope explained how mass had changed. Fidel. 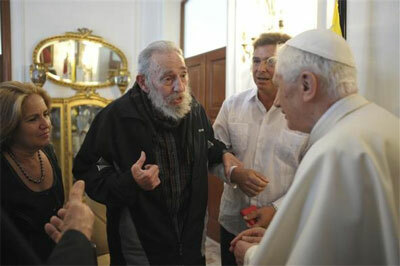 "Never excommunicated" Fidel Castro excommunicated? “The word excommunication does not feature in pope John XXIII’s dictionary”. The former secretary of Pope John XXIII, Mgr. Loris Capovilla said. (La Stampa's "The Vatican Insider" 3/29/12).